Of course you can! Learning a language through music transforms “studying” into fun, and having fun while you study is globally known as one of the most effective ways to learn. So drop your dictionary and turn up that volume! 😄 Music has this almost transcendental effect on the human body. It moves us and it can make us move. We nod along and tap our fingers and feet to the beat, and sometimes we even let out a dance or two. Music connects across cultures and can break down barriers. Getting to know the music is getting to know the culture and language in a significant part of culture. Music is Sticky: Ever had a song stuck in your head? Who hasn’t! Music sticks in your brain – which is why songs are so often used in language classes to help students memorise new words. Most people who enjoy music listen to their favourite songs over and over until they know them by heart. This repetition, accompanied by a catchy tune, is the perfect formula for getting new words and phrases stuck in your brain so you can’t get rid of them. No grammar charts required! Music is Portable: You can take music with you to listen to anywhere! Keep a playlist handy on your phone to listen to your favourite songs in your target language anytime you have a few minutes free. Be sure to listen actively; pay attention to the words, pronunciation and cadence for maximum benefit. And listen to it repeatedly! 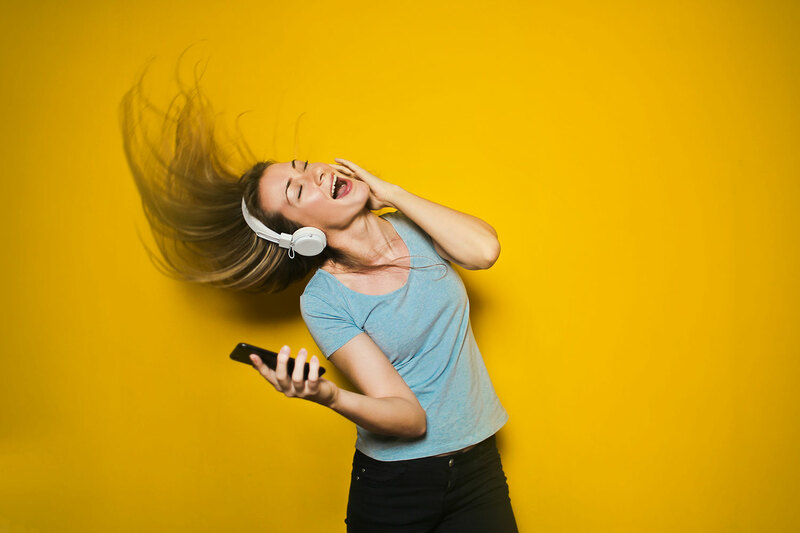 Singing Songs Improves Your Pronunciation: The joy of singing along to songs you love makes it easier for you to pick up correct pronunciation. And can actually reduce your foreign accent! Song Lyrics Help You Learn Vocabulary in Context: Learning how vocabulary is used in sentences is a key part of learning how to speak a language in the real world. You can’t learn isolated words and expect to get fluent. Listening to songs in your target language gives you something that no vocabulary list can: a context for words. You get to hear how words, common phrases, even slang terms that are used in real life. When you learn complete sentences along with their English translation, you’re learning how to use complex grammar without the need to memorise all the rules behind it. This means that you’ll be understanding and speaking your target language more, in less time than you would with some other study methods. You can really enjoy yourself by singing and it helps to improve your mood. Life would be way cooler if people sang more!